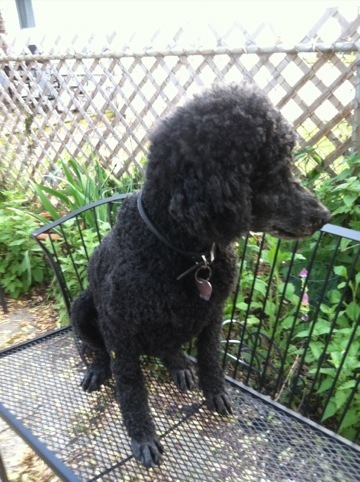 When I bought my standard poodle “Michelle” my husband and I were both working, we had savings, and our house was worth more than we owed on it. The grooming costs associated with a poodle really weren’t a concern. Little did we know at the time how much our lives were about to change! I left my job several months after we got Michelle because I was going through infertility treatments. The plan was that I would go back to work after the baby. There is a Yiddish proverb “Man plans, God laughs”. God must have been rolling on the floor laughing at us. If I had realized how much our lives were going to change I probably would have bought a hamster instead of a dog! Today the idea of spending $70.00 every 4 – 6 weeks on a dog’s hair cut seems crazy. I however am a DIY creative person who just happened to own clippers so I began grooming Michelle myself. 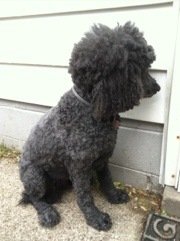 The poor poodle has had to suffer through some ugly haircuts as I learned how to cut her hair. 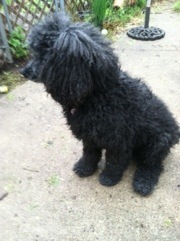 If you have ever known a poodle you know that they care about their appearance and they like to be pretty! Over the past few years I have become a decent groomer but sometimes I get busy and put it off too long. Michelle was WAY overdue for a bath and a haircut, I have been a very neglectful dog mom. Grooming normally takes a couple hours but when I wait too long it takes much longer. Yesterday was one of those days. Michelle’s hair was so long that I had to use the clippers to take off the bulk of her coat before her bath. If I didn’t trim her first, it would be difficult to get her clean and it could take a day just to dry. I used a 3F clipper blade which will leave her coat about 1/2 inch long unfortunately she had some mats and getting the clippers through her hair was really difficult. Because this is grooming on a shoestring I don’t own a lot of blades which sometimes makes the job more difficult than it needs to be. But I make do. So, when I first decided to blog about grooming Michelle my plan was to have some disgusting before pictures and then some beautiful after pictures. It sounded like a good plan for the blog — but if you are paying attention you know that God must be giggling at my plans! First, I forgot that Michelle is afraid of cameras so before and after pictures are going to be a challenge. But even worse – when I was almost done with her pre-bath trim my #%(&ing clippers broke. I attempted to repair them with no success. I finished trimming her as best as I could with a pair of scissors but it was really sloppy. The first trim isn’t supposed to be pretty but it shouldn’t be this ugly. I went ahead with her bath and I told her that she looked pretty, hopefully she won’t look in the mirror! Today I called the professional groomer and she agreed to fix my botched trim. Michelle and I walked into the shop with our tails between our legs. The groomer was kind and even tried to repair my clippers Michelle looked good when she was done. When we got home Michelle was so happy that she went outside and rolled in the dirt – I guess she isn’t as concerned with her looks as I thought! Here is her after photo. Notice how miserable she looks because I am pointing the camera at her! I will have to find a clipper repair before she needs another cut, at least that is my plan. I know that question well! Sometimes I tell people that she is a “curly coated French retriever” just for fun. Ah! The indignities of being Michelle! Nobody likes having a bad hair day!